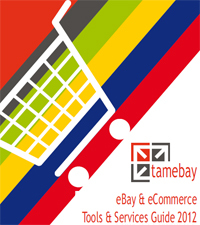 TameBay, the UK's ecommerce blog and center for eBay and ecommerce news, recently published their eBay & eCommerce Tools & Services Guide 2012, outlining the most useful tools and services available to online sellers, including reader recommendations. Founded by two British PowerSellers who have traded on eBay for nearly two decades, this blog was designed to keep users informed of eBay's new features, report current news in the ecommerce venue, and to provide eBay selling tips. Over the years, the focus of Tamebay has expanded to cover other ecommerce marketplaces, including Amazon and to provide relevant news to all ecommerce professionals. This is a great time to add TameBay to your “Favorites” to keep up with the latest holiday preparation information being put out to the ecommerce world. Click here to sign up and download a free copy!